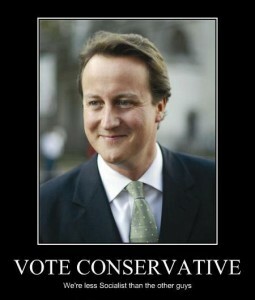 David Cameron is a Socialist? Now there is a provocative title. It’s the kind of statement that is sure to evoke incredulity, mockery, and make the Scottish Libertarians seems like tinfoil-hatted conspiracy theorists or Cold War paranoids seeing red under every bed. Nonetheless, that is our message and it demands an explanation. When libertarians use the word socialist we are not referring to Marxism per se, but rather to a social, political, and economic philosophy that has been dominant in Western culture since 1929. It’s more of an ethos or spirit of the age that dominants all major political parties and academia. 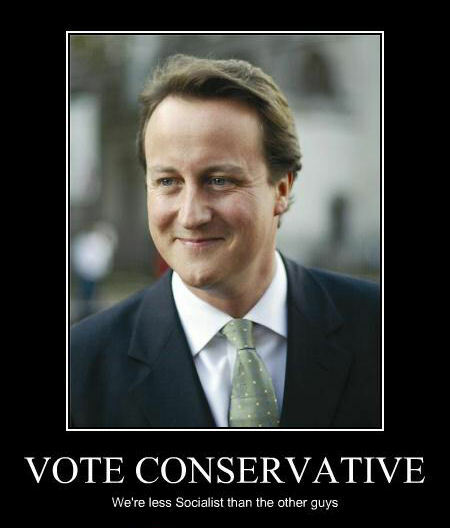 In essence, we are all socialists – even the Conservative leader David Cameron. To understand Socialism in this context, we must first look at what came before. Just as Socialism is the dominant ethos of this era, Liberalism (now called Classical Liberalism) dominated the previous one. Whether you were on the right or the left, the principles of Classical Liberalism were generally agreed upon by all parties. So a politician could declare that “We must ensure the flow of commerce” without a single voice of dissention being heard. In the same manner that today a politician, like David Cameron, guarantees that his policies would not affect the flow of public services with the only dissent being from those who do not believe him. The Classical Liberals believed that the purpose of government is to protect the natural rights to life, liberty, and property of each individual. In the early Twentieth Century, a split occurred among the Classical Liberals. Some believed that it was not enough for government to be little more than a referee ensuring everyone played fair. They believed that government should get in the game and be a proactive force for good. With the advent of The Great Depression, the Classical Liberal states of Britain and the United States seemed to flounder with the alleged failure of capitalism, meanwhile Socialist Germany and the Communist Soviet Union seemed to flourish. Many Western nations began following Hitler’s model by implementing a stronger centrally planned economy and welfare state. This is still the norm and the only difference between countries and political parties is a question of degrees. Since then, the socialist knob has been gradually turned up and with that more and more people are seeing the failure of the socialist system as governments of all parties routinely trample individual rights in the name of the greater good and central planning under the shadow of failing economies. This has resulted in the rise of libertarian parties throughout the Western world calling for a return to Classical Liberalism. I recently saw a humorous picture illustrating the difference between how men and women see colour. Where the woman sees maroon, plum, and eggplant, the man sees purple. By the same token, where the mainstream sees Liberal, Progressive, Greens, SNP, Labour, Conservatives, Republicans, and Democrats, the libertarian sees socialists. They are simply varying degrees of the same basic principle. All of these political ideologies and parties fundamentally believe that the purpose of government is to centrally plan and manage society and the economy for the greater good through the imposition of laws, regulations, and taxation all backed by the threat and/or use of government force exercised through fines or imprisonment. All that differentiates them is whatever they deem to be the greater good and the means to achieve it. Libertarians recognise that you cannot do good by violating the rights of others to their life, liberty, and property, whether this is done by individuals or by government. Having good intentions does not authorize murder, slavery, theft, or actively thwarting people’s choices where no one else is harmed. It may seem good in the short term, but in the long run you discover it was poisoned from the start. David Cameron is certainly not a socialist to the same degree as members of the Scottish Socialist Party. However, he was born into and has inherited a system built on socialist principles, many of which he may take for granted as “just the way things are” without fully appreciating the ideologies behind them. The voters that he appeals to are in the same boat, and so he must continue these policies if he hopes to get elected. However, if we look at David Cameron not through our modern lens but through those of a Classical Liberal Conservative, such as Winston Churchill, then we see him as just another socialist violating the rights of the people in the name of some “common good”. Is a writer from Los Angeles, California and has been living in Glasgow, Scotland for the past fifteen years. His written works focus on the Cultural Philosophy and History of the Romantic Era (1776-1929). 5 Comments on "David Cameron is a Socialist"
I don’t agree that Cameron is a socialist Daniel. All politicians, whatever their colours, are unable to really change things because they put re-election and political survival before the long term interests of the country. Thus, Cameron talks about spending cuts but because so many people rely on welfare “benefits”, it would be political suicide to cut to the extent required to reduce the deficit substantially. So he adopts the socialist model of taxing more and printing more fiat money to keep the plates spinning until the next election. FDR predicted this when he set up the New Deal. He knew that future governments, even the most conservative republican, could not unravel the socialist tentacles he had woven into the policy. With the advent of the globalist movement and the exponential growth in the size and power of multi-national corporations, the political and corporate worlds have morphed into a criminal conspiracy with an overtly socialist rhetoric but can only be best described as Fascism de facto. The revolving door between the Whitehouse and the big banks or Downing Street and the banks has facilitated the emergence of the criminal gangsters from Goldman Sachs, JP Morgan and the rest of them into funders of the political campaigns across the “democratic” West. And we know that he who pays the piper calls the tune. The increasing authoritarianism here but especially in the USA clearly shows the flimsiness of the democratic veneer they portray and our freedoms have never been in so much danger. So in the final analysis it doesn’t matter if they are conservative, liberal or socialist on the outside, they are all Bilderberger fascists on the inside. The conversatives cut welfare for those activily seeking work or unable to work and increase welfare for those over 65 many of which are fit to work but choose not to do so, or make no effort to find work the enitlement culture of the baby boomers. The conservative government like labour support welfare for the base, where as labours base may have been public sector unions, the conservative is the retired may be. 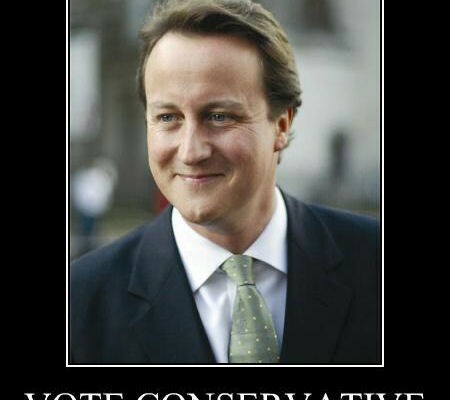 Is Cameron a socialist? No. You have made the same mistake many people make due to the mainstream media misusing the word. Socialism is worker self-management and direct democracy. The idea that workers can run their place of employment without hierarchy and that democracy should mean society votes on ideas, rather than votes for a leader which is the case with a ‘liberal democracy’. Socialism is sometimes called lower stage Communism, because higher stage Communism is a system without money and a vastly superior technological set up so that no one need sell their labour power or require the state in order to live a happy life. What Cameron is is a one-nationist. One-nation conservatism was created by Benjamin Disraeli in reaction to the panic which struck the elite. Socialism, as defined above, was becoming popular and the elite needed a way to maintain its power and status, so advocated a system where the elite would care for the poor in order to stop uprisings. Worth a mention that the first welfare state was created by Otto von Bismarck – the same pass who passed Anti-Socialist Laws as a reaction to the threat of a socialist movement trying to create a democratic paris commune style system in Prussia. With regard to that very cogent article by. Daniel Logan Scott.Rather well put I,d say,well done.One is somewhat flabberghasted to find such logic boldly stated in Scotland,but about time too!after all its only 85 years or so since it became part of the popular polical debate in America with the novels of Ayn Rand,and even longer since Ludwig Von Mises wrote his important books. It reminds me of the apocryphal historical line that Scotland was in fact the last country in the past era to adopt the bagpipes after almost every one had been playing them for thousands of years.Only in this age of imperielism marketing and information control could that be transformed into a defining cultural characteristic along with shortbread whisky and the ladies from hell. No doubt once Scotland at last finds the courage to confront these ideas we will tell the world we invented them along with david hume inventing philosophy and our courts burning thomas aitkenhead 100 years after England had stopped doing that vile practice. Sadly,although we do in fact,in my opinion live in an age where the tail repeatedly wags the dog,the Scottish tail is one hundred years or so behind the dog and so has little chance of wagging it. If anyone can understand this gibberish,then youre all very welcome to come to the highlands and say hallo. Further to Thomas Aitkenhead,he was in fact hanged for blasphemy outside Edinburgh 85 years after the last person had been burned for blasphemy in England.He was the last person to be executed for blasphemy in Britain.He was a medical student and quite cogent in his reasoning.its a dreadfull tale of ignorance and cruelty.